Can you write custom filters? I need to take a binary log and capture the changes into my own tables. The THL is not useful to me in the structure that it is in. For each set of committed RBR events on the table I write the old/new tuples into the log table. I also maintain a transaction id. This is somewhat of an oversimplification, but I hope you understand what I need to do. 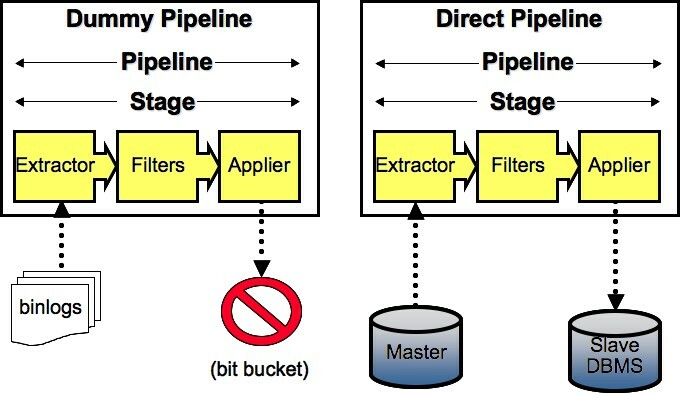 These table logs can also be used by ETL tools. 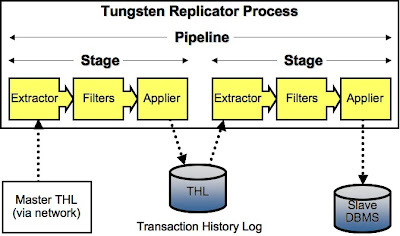 If possible, I'd rather use something like Tungsten, which specializes in replication, instead of my own custom script which uses mysqlbinlog -v.
a. 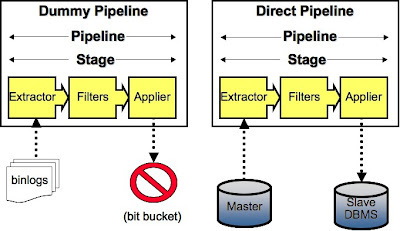 Develop it in Java in the same manner as already existing filters are done (JAVA package com.continuent.tungsten.replicator.filter). Does flexviews have a configuration file that defines the transfer tables? I had a quick look at your code download from SourceForge but did not see it. We could of course infer this automatically by reading table schema and then doing an automatic transformation on the RBR record to drop it into the correct transfer table. That would actually be a pretty flexible implementation...I know other people who could use this including the gentleman whose blog was cited in this article. table_schema, table_name point to existing tables in the database. mvlog_name records the mapping name (usually schema_table_mvlog) for the changelog table in the Flexviews schema. To clean up the transfer tables (my _mvlog tables) I have to find the oldest transaction_id which has to be kept around for any particular table, based on the views that are created on the table. Then I do a DELETE w/ LIMIT 1000 in a loop and remove all records which are older than that id. This delete is always a range condition on a key, so it performs well. It doesn't matter if I remove all the rows related to a transaction at once, because it is guaranteed that no Flexviews refresh will ever have to read the rows that I am deleting because they are older than the transaction id to which any views which use the base table are refreshed to. I'll look into using a custom applier. This sounds like exactly what I need. I'll post to the mailing lists if I get stuck. Also, I don't read from the flexviews.mvlogs table for every RBR entry. When I start processing a binary log, I cache the entries from the table locally. I refresh the cache if I see an RBR entry for the table which lists the tables to log: flexviews.mvlog. This allows change logging to be enabled/disabled at runtime. As soon as change-logging is turned on the consumer will start collecting changes for that table, in a consistent fashion. OK, good luck. You can post problems/questions on the Continuent forums at http://www.continuent.com/community/forums. That's absolutely correct. I'm writing a parallel replication algorithm that works within a single stage but you can do it using multiple independent stages exactly as you suggest. Another feature that will go in shortly (I mean within a few days) is multiple replication services within a single replicator process. That would give you the same effect and in addition would allow you to turn pipelines on/off independently of each other. I would like to amend my comment about using stages for parallel replication. What's missing is logic for restart--as currently written, stages will trample over positioning information required for restart, because they will all write to a single table named trep_commit_seqno. You would have to write a different applier to fix this. We will have a commercial version of parallel replication that will fix this and other issues. In the near future, however, you will be able to use multiple replication services as mentioned in the previous comment.